A couple of decades ago Playa del Carmen was the small, sleepy fishing village tourists passed through on their way to Cozumel. Now it's the center of the Mexican Rivera, and has itself become a mecca for travelers seeking a south-of-the-boarder holiday on the Caribbean Sea. 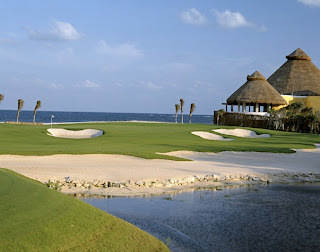 Playa offers Mayan ruins, beautiful beaches and golf. Lots of golf. 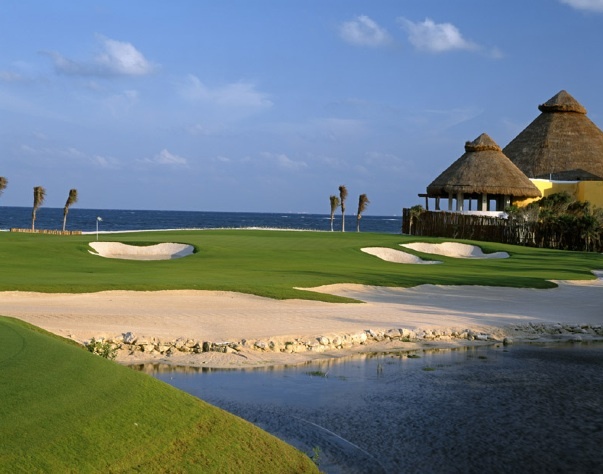 There's the Norman designed El Camaleón Golf Club at Mayakoba, site of the PGA Tour's Mayakoba Classic. Then there's Robert Von Hagge course at Playacar Spa & Golf Club and a Jack Nicklaus design at Moon Palace Spa &Golf Club... to name just a few in the area. The above resorts sound dreamy and romantic and all, but what if you wish to combine your golf break with a bit of old-fashioned... debaucherie? Well then you may wish to book your stay at the Reina Roja Hotel. "Upon arrival, you’ll notice everything is bathed in red light, from the deep, rich wood in the lobby bar to the chains hanging next to your bed." ... and this ... "Eventually, you’ll return to one of the hotel’s five themed rooms. There’s the Espacio Erótico, which comes equipped with an extra-large cage—for very large birds, of course. But we’re thinking the After Hours space, a soundproofed abode with disco balls, room for eight people and mirrored ceilings." So there you are. And get this golfers: The themed rooms include one that appears to be designed especially for prurient putters; it's lined floor to ceiling with artificial turf ...the bed even has an astroturf comforter. I'm guessing The Reina Roja would easily make the Sunday Times World's Best Hotels for a Dirty Weekend list. Salacious sandbaggers can make reservations at reinarojahotel.com. I don't think AstroTurf would be very comfortable. :O The resorts look gorgeous though. Whow, I was in Playa del Carmen in the early nineties and would probably not recognize it again. We moved on south to Tulum back in the days, that was even more remote. Any ideas, how it is looking there now?